I know you've likely seen this cover already, but it's frankly too pretty not to post. Also, it's Donia. And I love Donia. 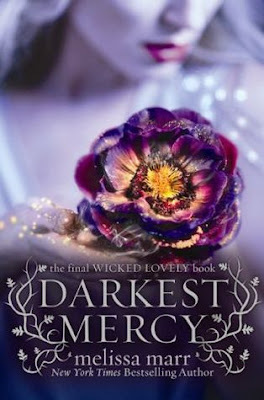 This is the cover for Darkest Mercy --the fifth and final book in Melissa Marr's Wicked Lovely series. First of all--so pretty. 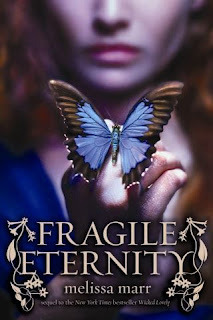 This series has just had consistently gorgeous covers and I love seeing that, especially for a series I've followed and enjoyed (I should say that has inspired the full range of human emotions in me--which can only be a good thing--even when I'm railing against some bit of nonsense Keenan got himself up to). 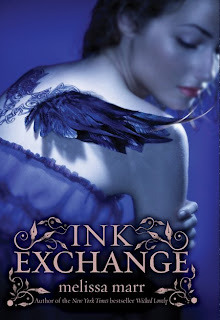 Second, as far as my favorite goes, it's definitely down to either the cover of Ink Exchange or the one for Darkest Mercy . I love them both. But I think, I think, I'm gonna have to go with Ink Exchange . Because it's Leslie. And it's Irial's tattoo. Coming alive. 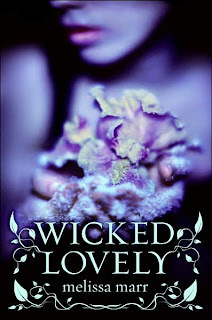 And I love the imagery, the book, and those characters so much they will always hold a special place in my affections. So bring on Darkest Mercy , Ms. Marr. I cannot wait to see how you wrap the whole thing up. I've seen this cover around and while I still haven't read RADIANT SHADOWS (my least fav cover) I find this one simply beautiful. Like completely gorgeous. I think I full on gasped when I saw it first. So yeah, maybe I'm going to be picking up RS and DM just because I want to see how it all works out in the end. I haven't read this series yet but I have the first book. I really like the Darkest Mercy cover. I LOVE that flower and the colors. Again, never read the books so I have not idea of symbolism/tie-ins I just think it's purty! Yeah, these covers are probably some of the pretties ones i've seen. I just wish i could enjoy the series as much as i like the covers. unfortunately, it doesn't always work out that way in the book world. Darkest Mercy is stunning. Melissa Marr hit the jackpot with her covers. I haven't see the Darkest Mercy cover before, it truly is stunning. I'm not the biggest fan of her series but that sure made me want to pick up Radian Shadows so I can read this one as well(I hope the series gets better). Michelle, agreed. RS cover is my least favorite. But this one--wow. Just wow. Mollie, it IS purty. :) Give that first book a try sometime and let me know what you think. Kaz, LOL. That's true. I hadn't seen her in that light. But I'm glad we're one on the cover of INK. Which is your favorite book? Daniela, *sigh*. It doesn't, does it? So many books with gorgeous covers leave me cold. And then the opposite is completely true as well. Unfortunately. Tiah, seriously. I would be ecstatic if they were mine. Ladybug, RS wasn't my favorite book in the series , though I enjoyed my favorite characters in it quite a bit. But I've got high hopes for the conclusion. I haven't seen the Darkest Mercy cover yet. I LOVE IT! The title is great too. 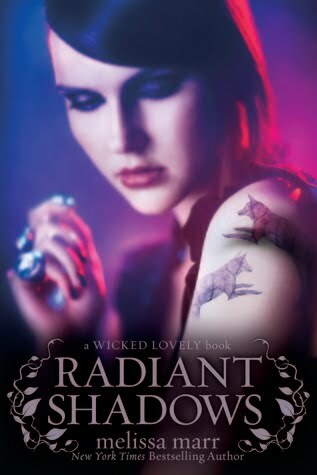 I'm reading Radiant Shadows right now. I look forward to reading the last book! This is my joint favourite cover of this series. I've always liked Ink Exchange best, then Wicked Lovely, but this one's incredibly gorgeous. @Michelle, Don't judge Radiant Shadows by its cover, in my opinion, it is the absolute best book in the series so far!